As a blogger, I get to do reviews! And that’s kind of fun. So far I’ve reviewed things I’ve gotten and used on my own. 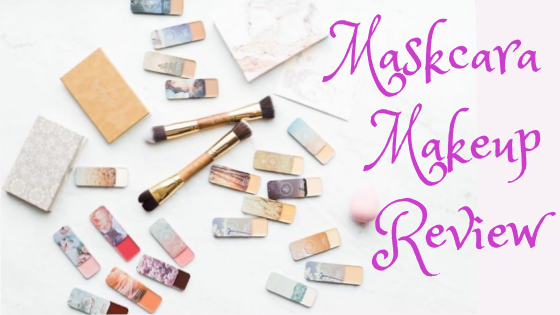 But today I’m doing a review of Maskcara makeup. Some of these items were purchased and some were submitted to me in return for my honest review. 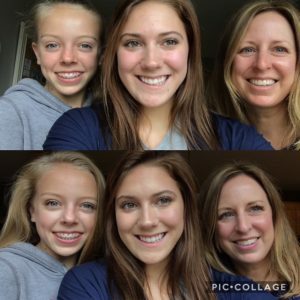 I opted to do this review because if you’re a mama that wears makeup, you want to know what works for you and streamline the process to make more time for other things. Here are Beth’s two free e-books. 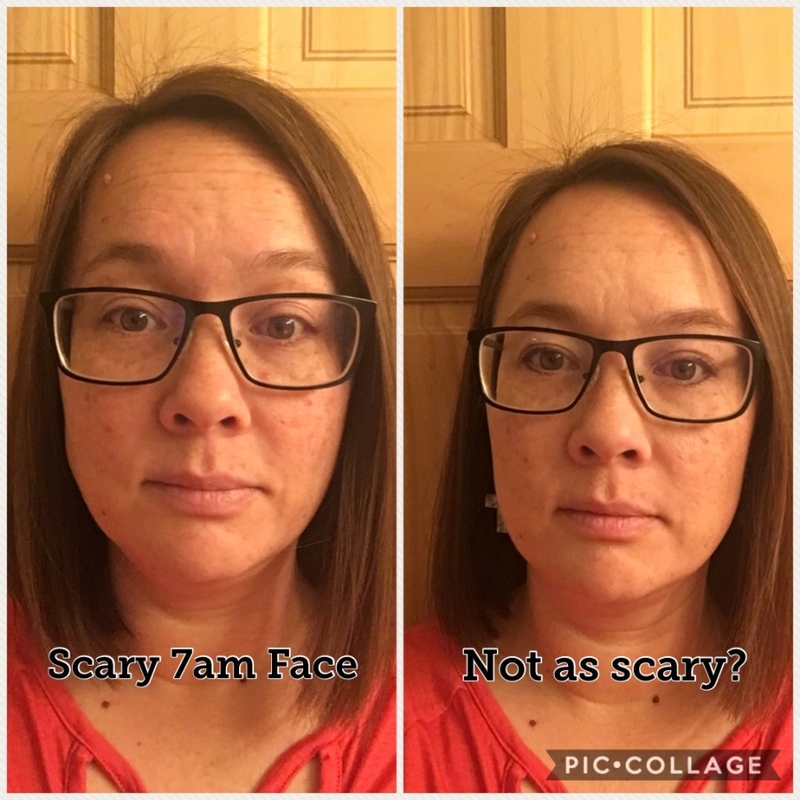 Mascara Beauty Method ebook and the MBM Makeup Routine in your 30s and 40s. Download them free here. If you make it alllllllll the way to the end, there’s ANOTHER special for you! Now, I wear makeup. But I’m not exactly a junkie. I’m a light makeup kind of gal. Previously, I left the house regularly with a bare face. But as the years go by, I admit that happens less frequently. I’m less likely to be spotted in the wild with my true beauty shining. I usually have at least a little foundation and eyeliner. Having had major skin issues in my youth, I have always been on the lookout for foundation that covers scars and imperfections while looking somewhat natural. But my search has shifted lately to accommodate new issues of over 40 skin! Having at least one teenager who wears makeup regularly, I have witnessed the contouring trend. I did not subscribe to it myself. It scared me. I don’t even wear blush for fear of a clown face! Too many color options to choose, too many layers on my face, too much time to learn, too much chance of messing up! 1. Simplify – Declutter and streamline your makeup. Buy only what you want. When you want it. 2. Better Basics – You’re not one dimensional. And you’re makeup shouldn’t be either. Light your face! 3. Save time – does this need explaining? 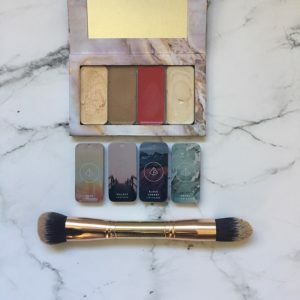 So I tried out one of their face palette’s assisted in color selection (something with which I struggle) by Beth Coleman, a Maskcara Beauty Artist. The IIID foundation palette is their flagship product. 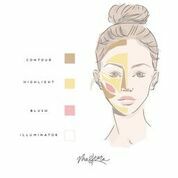 This, supposedly, is your gateway into the art of highlighting and contouring (what they call HAC-ing). Here are the basics of that and the handy little guide you get with the palette. I used the 30 Second HAC Brush and received the Stay Out There Setting Spray to help the makeup last. I like that application is pretty quick, even with several colors goin’ on. I like that I’ve gotten comfy with using blush. I was kind of blush-phobic before, but this gives a nice wash of color. I like how compact and flat it is. I like that it’s really one layer, if that makes sense? One thing that I was put off about before with the HAC thing was that it seemed like a lot of makeup. Foundation, then contour, then highlight, then…….? With this, the highlight and contour ARE the foundation. I don’t know how well it would cover major pimples or blemishes? It might with a pretty thick layer, but I’m not doing thick layers. So I guess I’d say this is medium coverage? Remember: I’m not too savvy about such terms. It’s kind of pricey, but if you already use a lot of products, it might save you money since you can streamline somewhat. I wasn’t sure how long this foundation would last. Or how it would do on a hot summer day. I did read that some people have an adjustment period to cream based makeup, where their skin treats it like moisturizer for a bit? Now, there aren’t many days when I put on makeup first thing in the a.m. and need it to last til midnight. But some days I would like to look put together for much of the day. Enter the setting spray. This was recently sent my way, so I don’t have as much experience with it. BUT I have been trying to use it in different ways and with different makeups, too. The first thing I’ve learned is that I STINK at spraying things onto my face. I can’t aim. It ends up in my hair. Or wall. SO I discovered a trick: spray a beauty blender with the setting spray and then dab your face. No aiming required! Second tip? 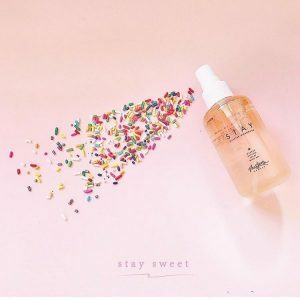 For extra staying power, apply the spray both before and after the makeup. This spray seems to really work. When I wash my face at the end of the day, it feels different now – my face feels slick as I wash it. I’m guessing the spray is washing off? I am liking the products I’m using. The spray I am using almost daily. The foundation I use regularly, but mostly when I want to be a little fancier (church, social events, etc), not to workout, school pickup or library run. Because it’s more than I’d usually pay for makeup, I want to make it last! OH, Beth gave me a tip for that. When the little tin starts getting empty, place it on a flat iron or something similar to gently melt it all back to the bottom and center so it’s easier to grab! I see myself re-ordering my highlight shade, but the blush and illuminator will last me much longer. I’m not sure how long the spray will last, but I’m guessing quite awhile! I don’t get very fancy with my eyes and don’t have much confidence for using much color there, so I can’t speak for how the shadows work. The brush is very nice to use with this system. Though you can’t store it standing up since it’s two sided. If you contact her and mention Productive Mama, she will take $5 off the price of a 30 Second HAC brush!